A small number of devices with the GoTheatrical! App pre-installed are available to borrow from the thaetre. They think they’re together for a camping trip, a bit of fishing, a few yarns. But there’s important stuff amongst the hilarity. What it is to be safe. What it is to belong. Who owns stories. Where we’ve come from, and where we’re going. How do you reconnect with community, if you’ve been wrenched away? What hoops do you have to jump through? Inspired by the landmark TV series, Women of the Sun, Winyanboga Yurringa (Win-yan-boe-ga Yur-ringga) begins in familiar territory – a gathering, a return. 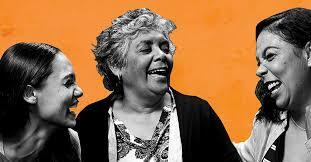 But little by little the play rises to a sublime, surprising act of belonging and remembering. It’s beautiful.